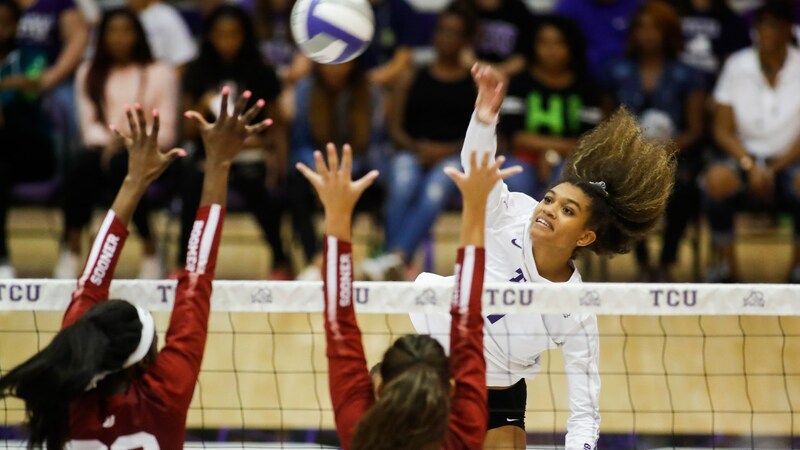 élan McCall (TCU) and Keyton Kinley (Oklahoma) were named week 13 volleyball award winners. McCall was named Offensive Player of the Week and Rookie of the Week after two double-double performances last week. The five-time Rookie of the Week winner led the way for TCU, as she put down 5.43 kills per set over both matches at a .516 hitting clip. She marked a career-high hitting percentage (.583) after a 22-kill/14-dig performance against WVU. Make that 6⃣ weekly honors for élan McCall! On the defensive side, Kinley earned her third Defensive Player of the Week honors after leading the Big 12 in digs (44) and digs per set (7.33) last week. The sophomore tallied 25 digs against West Virginia, the most digs in a three-set match in the Conference this season. She currently leads the Big 12 in digs per set in all matches (5.12) and digs per set in conference contests (5.86). She does it again. Congrats to @keyton_kinley4 for being named the Big 12 Defensive Player of the Week for the third time this season! This week’s awards mark the sixth all-time for McCall and third for Kinley.